European built percussion replica pistol. 9" barrel overall 15". This pistol has a working action but a solid steel non shootable barrel. A replica pistol that would make a nice decoration item. 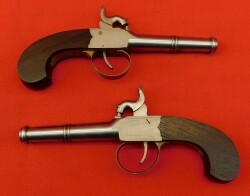 Excellent replica of a U.S.
European built replica, non firing percussion pistols. Built with a solid non shootable barrel. Overall length 7 12" barrel 3 1/2". The action functions perfectly. Antique U.S. Springfield pistol carbine dated 1856. This is one of only 4,021 pistol carbines built for the U.S.
William Tranter double-trigger 3rd Model persussion revolver. This example shows a 6 5/8" barrel with a bright excellent bore. This revolver was built circa 1858. One of the scarcer variations of the French Gandarmerie flintlock pistols. This example was built by Piston of Schmalkalden, Germany when this area was under the control of Napoleon. NSN is a single Travelling Percussion pistol built by one of the best English makers,Durs Egg, London. 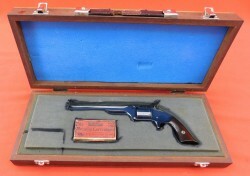 This defensive pistol shows a 5 1/4" barrel of approximately 64 caliber. A transitional revolver of about 45 caliber built or retailed by Charles Johnes, London circa 1830's . 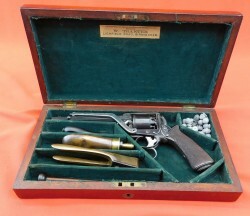 These were a cross-over from the Pepperbox to the later revolvers including the Colt. 5 3/8"